How far along? 17 weeks. 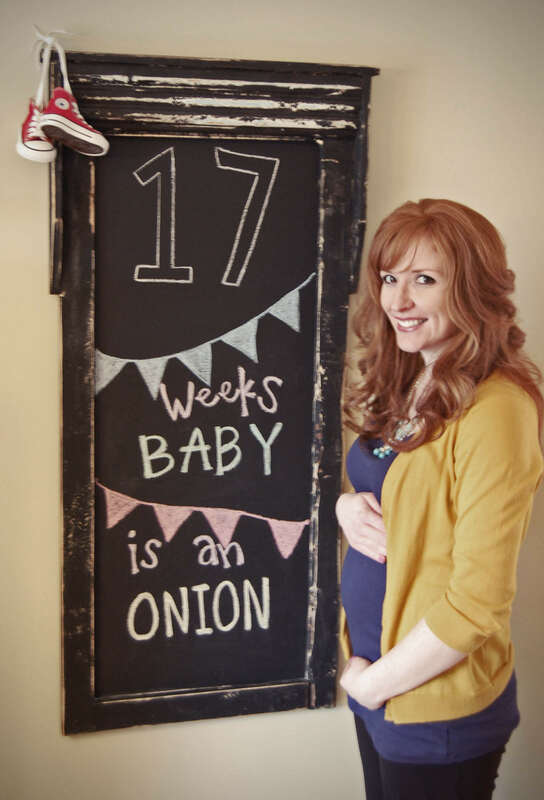 Baby is the size of an onion. Maternity clothes? Not yet. I stopped in one of the only maternity stores in town and it was really depressing. Everything was cheaply made and overpriced. Best moment this week: Can Easter candy be a best moment of the week? Because I’m really loving it right now! Food cravings: Still the same favorites this week: pickles, raspberries, and cottage cheese. Anything making you queasy or sick: Raw meat, carrots, and broccoli. Gender: We find out in less than 3 weeks and we can’t wait. Labor Signs: Way too early. Symptoms: Just feeling a little tired. Looking forward to: Finding out the gender and getting started on the nursery. You look sooo great! Depressing that the maternity place didn't have anything fun. Although I'm pretty sure you're going to have adorable maternity style regardless. You are adorable!! I can't wait to find out what gender your little one is in 3 weeks! Question – how many times do you rewrite that chalkboard before you take the picture??? HAHA It's sooooooooo cute!!! I feel like your pregnancy is going fast! Must be the updates!! You are still itty bitty!! SO glad to hear you're doing well and getting started on the nursery! Yay!!! Ready for the belly pop? It's coming! The 18th week was a HUGE week for me, belly pop, baby movement, lots going on! Can't wait to find out what you're having! I THINK YOU'RE HAVING A GIRL!!!!!!! You are looking so good mama! I love your little bump! I know the obviously answer is a healthy baby…but if you could pick would you want a boy or girl first? week 17 already?! i love it!!!!! SUCH a cute idea! You are adorable momma! Love the chalk board and the baby updates!!! If it weren't for Easter candy, I would probably weigh 5 lbs less!